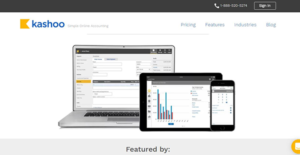 Kashoo is a cloud-based accounting application for freelancers, small business owners, and independent entrepreneurs. It is an easy-to-use software that provides the simplicity and flexibility required by small business owners to govern their books. The platform empowers users to manage their audits, taxes, and other accounting tasks the way they want anytime, anywhere, on any device. Kashoo is an online accounting solution used by small businesses owners for invoicing, generating reports, tracking expenses and bills, and more. It provides a bunch of great features that enable users to monitor the financial well-being of their business with ease. Some of its key features include expense tracking, bank reconciliation, billing & invoicing, tax management, account receivable, accounts payable, payroll management, multicurrency, and credit card payments. Kashoo is a reliable financial tool that is expertly crafted with an intuitive interface and easy-to-use features that facilitate core accounting functions for small business owners. The software provides custom invoice templates that help you create and send professional invoices. It also allows you to set up recurring invoices which can save you time especially if you serve clients with recurring orders or you run a subscription-based business. It is easy to track and monitor expenses using Kashoo. The expense tracking feature allows you to capture an image of the receipt, attach any file, and log it into the platform in seconds. Every business purchase is filed in the corresponding expense account and is easily accessible when filing taxes. With the solution, there are no missed expenses which translate to better financial control and more profits. Better still, Kashoo has an intuitively designed dashboard that lets you see the financial health of your business in real-time. The dashboard shows you the income, expenses, profits, and losses made by your business. It allows you to forecast and make informed decisions with instant insights into monthly and annual accounts receivable, accounts payable, expenses, income, and more. Additionally, there is a bank reconciliation feature that reflects all the transactions and amounts of your business bank accounts. The feature gives you options to import your bank statements by .qfx, ofx, qbo, or leverage the power of the live bank feeds tool. Kashoo spontaneously suggests transaction matches and allows you to reconcile your bank statements in minutes. There are trendy and widely used applications in each software category. But are they automatically the best fit for your enterprise’s specific wants? A popular software solution may have thousands of customers, but does it present what you need? For this reason, do not blindly shell out for popular systems. Read at least a few Kashoo reviews and think about the aspects that you desire in the software such as the fees, main functionality, available integrations etc. Then, shortlist a few solutions that fit your requirements. Check out the free trials of these apps, read online reviews, get explanations from the seller, and do your investigation meticulously. This in-depth groundwork is sure to help you find the most excellent software application for your organization’s special requirements. We realize that when you make a decision to buy Accounting Software it’s important not only to see how experts evaluate it in their reviews, but also to find out if the real people and companies that buy it are actually satisfied with the product. That’s why we’ve created our behavior-based Customer Satisfaction Algorithm™ that gathers customer reviews, comments and Kashoo reviews across a wide range of social media sites. The data is then presented in an easy to digest form showing how many people had positive and negative experience with Kashoo. With that information at hand you should be equipped to make an informed buying decision that you won’t regret. What are Kashoo pricing details? What integrations are available for Kashoo? If you need more information about Kashoo or you simply have a question let us know what you need and we’ll forward your request directly to the vendor.